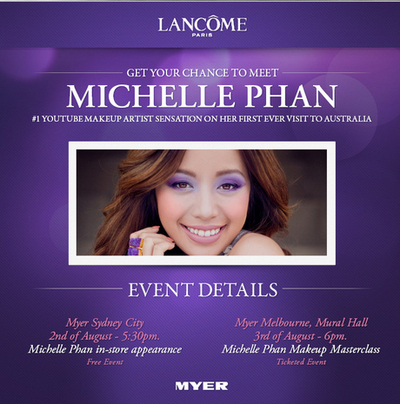 Michelle Phan is an internet sensation. In fact, she's been dubbed 'the Justin Bieber of makeup'. And she is not only an online phenomenon... she is phenomenal. Her videos have been watched an incredible 575,615,667 times. Just watch how she does what she does - it's kinda mesmerising. And you can catch her in Australia right now. She was at an instore appearance at Myer, in Sydney tonight... tomorrow, she scoots off to Melbourne, for another in-store. Scroll down for deets. Sunset eyes [now this is different... and impressive]. Even tips for beauty on an aircraft! Ah, I love Michelle... thanks for the post. Seeing her in Melb today! Excited!! 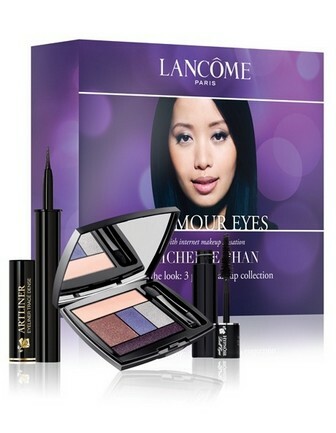 I heart you Michelle, and very smart peeps at Lancome... I could watch her vids her day...!